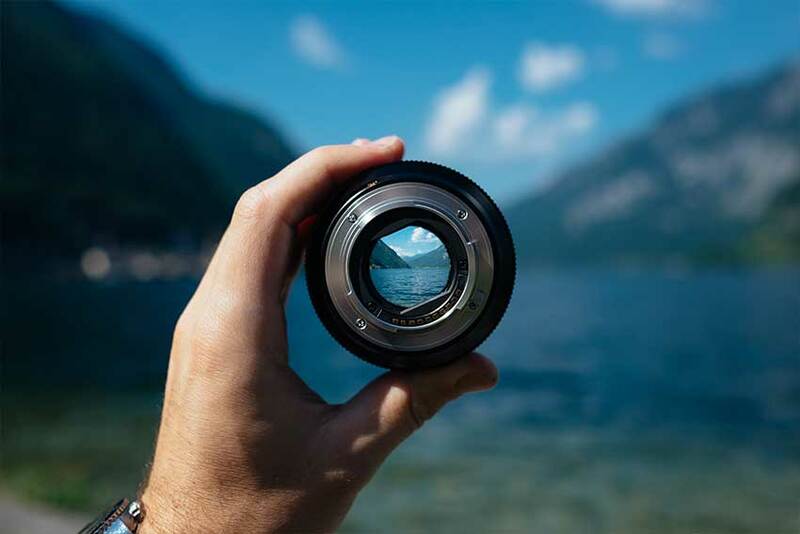 If you are the type of hiker or backpacker who wants the total control of your journey and enjoys the nature to the fullest, then the monocular is a must have for you. It will increase the comfort and enjoyment of your journey whilst loading you with minimum weight. Best monocular for backpacking and hiking offer tremendous value to the user. So, having knowledge about the best ones and picking accurately is very important. That is where our article comes into the show. 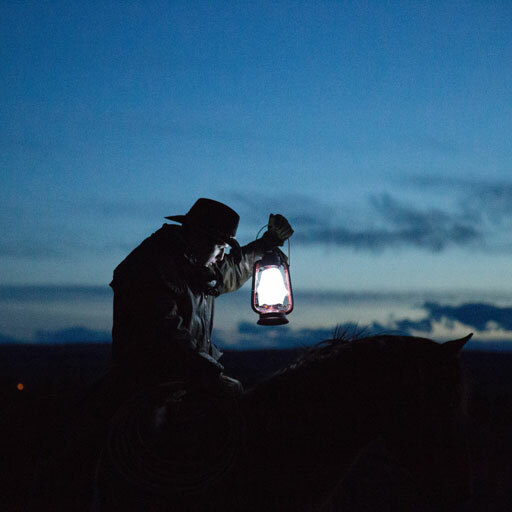 Here, we’ve handpicked the ultimate choices for you that will assist you in the wilderness to watch out the routes, sceneries, and other objects along the way. An in-depth guideline is also included for an easy understanding of the user. Let’s go then? Why Should You Take a Monocular for Backpacking and Hiking? Best Monocular Reviews for Backpacking & Hiking! This exotic piece of beauty, the Wingspan Optics Explorer, is one of the Wingspans special design for those who love to get greater magnification as well as a bright and clear field of view. This is a design for optimizing power, distance, and the clarity of the view during the daytime. The monocular will bring the object 12 times closer by its powerful magnification. The 50mm lens helps to give you a brighter and clearer range of view. 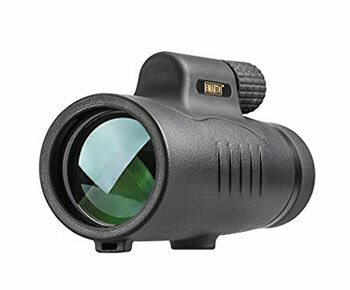 This high powered monocular is designed to provide you with a non-slip and secure external armor. The external body will be protected from any damage or scar. The whole body is waterproof and fog proof. It will not allow any dust, debris or moisture to get inside the body. No internal fogging is also ensured. In all weather condition, the monocular will be at your service. The ergonomic design will allow you to handle and focus on the target very quickly and accurately. This mono has a prism type called BaK4 which has a higher refractive index than other prisms. The eye relief is 14mm which is also very comfortable for the user. The close focus ranges of the monocular are 2.5m. It has the field of view of 246 ft./1000 yds. It comes with a carrying case made of nylon mesh, lens protection & eyepiece covers, and a microfiber cleaning cloth which is non-abrasive. The mono doesn’t offer any tripod with it. Besides, it can only be used in the daytime. But, the price it comes with, that is not an issue at all. This is your go-to choice at any day anytime. 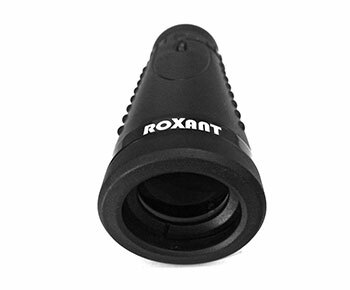 This ROXANT ROX-GS is a super addition in the monocular series for the outdoor lovers and adventure seekers. The mono has a wide view capability with magnification 6x. many may wonder how this can be a good magnification. 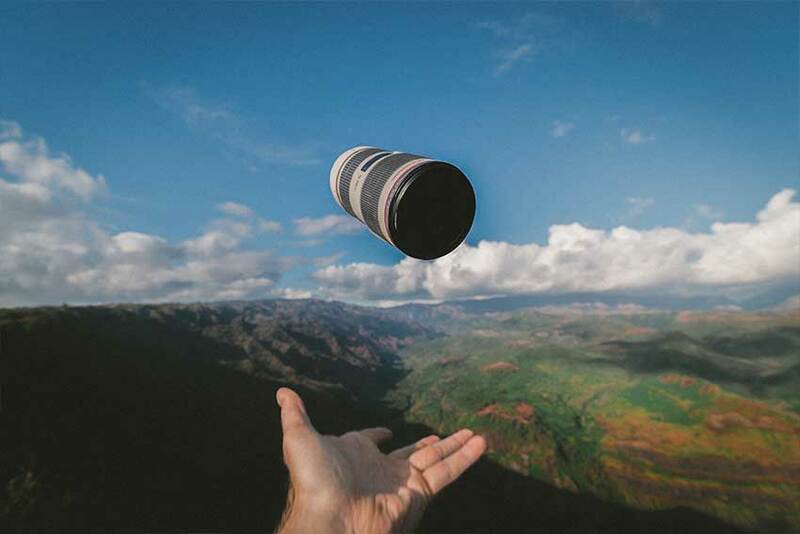 But, the fact is, when you are going for an outdoor activity with the mono in one hand, you can’t focus on the target without any jitter or shake. So, the more magnification will ultimately make your target defocused even more as magnification will be higher. And, you need super stability for your hand to use 10, 12 or higher magnification which is also available on the market. The glass is made from high-end optics i.e. BaK4 prism. The 30mm lens will enable high quality, compact, and solid view. It has a comfortable molded grip that is designed for optimum handling in every situation. Less shaking will happen for this lightweight monocular. The BaK4 prism ensures the brightness and light transmission to be superior for achieving a clear, bright, crisp view. 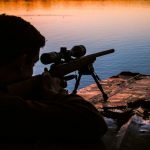 The mono is a superb tool for bird watching, archery, hunting, hiking, camping, target shooting, outdoor activity, travel, and so many other choices. It comes with a carry pouch that includes a belt loop. There is also a cleaning cloth and a neck strap for smooth handling. No tripod is included with the monocular. But, the 6x doesn’t require any telescope or tripod as optical experience is better without any. Besides, with this low and affordable price, that isn’t any concern. Great choice for backpackers. The third choice is this High Power 8×42 Scope which is made to serve with high precision and accuracy. It is constructed with high-end glass optics. The high power telescope offers 8x magnification with an objective diameter of 42mm. It has a large field of view of 360ft./1000yds. So, you will have the best view of your outdoors. 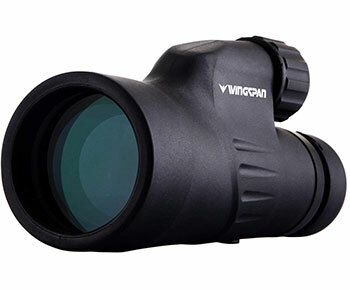 The high-quality BaK4 and the fully multi-coated lens do strengthen the key functions of the monocular. The light transmission rate is about 99.9%! That’s really spectacular for such a low priced scope. Light reflection, as well as multi-coated optics, will enable the brightness and superior light transmission with minimal distortion. This cool feature helps to see at night in low light. That’s an added quality that many of the monocular don’t offer. The monocular telescope is nitrogen filled, thus becomes waterproof. The built-in lens dust cover helps to protect the lens from debris, moisture, and dust. Its rubber coated finish helps to resist shock and makes it durable in a rough environment for a long time. Also, don’t forget that it’s fog proof too. This compact model is really easy to grip and handle with maximum comfort. There are adjustable eyecups that can be easily twisted up and down for getting optimal viewing with or without the glass. The striped rubber armor helps the user by creating more friction when handling by not slipping away from the hand. There is a strap and carry case that comes with it. One amazing part is the tripod connector that lies at the bottom of the mono. It is the perfect outdoor gear for fun loving people. Monocular is a super gadget for any outdoor enthusiast. It enables you to see distant objects and plan accordingly. When you are going out on hiking or trekking, you should always carry one in your backpack. You can watch the landscapes and surroundings very easily and comfortably while walking with a monocular. For a binocular, you need two hands. But, a monocular can be handled with one hand comfortably. The handling and navigation are much smoother for a monocular. The backpacker can rely on them for watching the route searching for any potential danger. It helps to plan the journey accordingly. The mono is very light compared with the binocular. 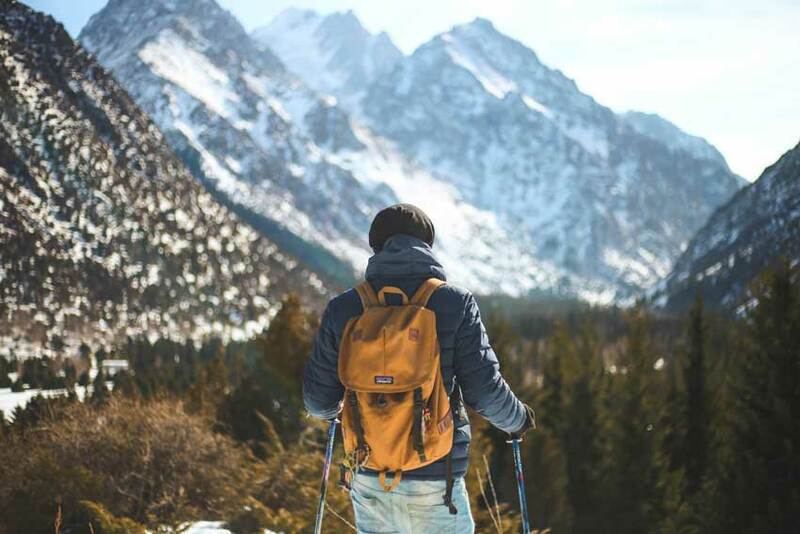 When you are going out for hiking or backpacking, you need to lessen the weight as much as possible in as many ways as possible. You can carry them in your pocket. That’s how handy they are. They are much compact designed than a binocular. As a result, they are much more durable and strong. They can withstand the rough outdoors better and are water, fog, dust, and shock resistant. Along the hiking or backpacking journey, you can use them swiftly for getting any quick view of the outdoors. So, they are for quick use. besides, they are versatile in use as you can use them for bird watching, target shooting, hunting, nature observing and many other events. There are some criteria on which you can decide whether you should go on with buying a monocular or not. If you have a clear understanding of those things, you won’t blame yourself for buying the wrong ones. So, let’s learn what are those criteria. This is the most important feature of a monocular when you are choosing one. Many of the buyers get confused with this specification. So, clear knowledge about this is a must. This specification is written in two numbers which are multiplied between like this 8×42. So, what does that mean? The first part is the 8x, which basically represents the magnification power of the monocular. It means how many times bigger you’ll see the original object through the lens. The range of the magnification varies between 4x and 25x. the bigger the number, the better magnification you get. Although, bigger magnification means expensive price it ensures a better quality target image. The magnification is the ultimate feature of a monocular. Low magnification means a limited field of view. The next number represents the objective lens diameter. It is located in the far part of the scope. As for the above example, the lens diameter is 40mm. The diameter controls the amount of light that will come into the monocular. The more light comes through the lens the better the image quality will be. Likewise, the price will go up. So, pick the right type of lens diameter next time when you are buying one. The coating of the lens can also vary for the monocular. There are basically four types of coatings. Let’s learn what are those. The first one is the FMC type. It means a fully multi-coated lens. This one is the best type among the four. It offers the best result by resulting in maximum brightness. Also, it is the most expensive one. If you want the best quality, then this type is for you. Because of the FMC lens, the durability is also ensured. The next one is the multi-coated lens. Naturally, it is cheaper and offers less than the fully multi-coated ones. But, for a regular type monocular, it can be a good choice. It also offers a relatively high resolution for the user. You can also go for it for the best result. The third option is the fully-coated lens. The lens has a single coating of the layer and will offer less clear images for you. Because of this cheaper option, you will not get the best result. The lens is also prone to the glare of the sun. As a result, viewing is not enjoyable for this lens type. The last and cheapest option is the regular coated one. The quality is very poor and it is not recommended to buy. If you want a budget option for very simple uses, only then you can go for it. Otherwise, it will be a waste of money. There are three basic types of optical design available for your monocular. Those are porro prism, roof prism, and Galilean prism. Among these three types, the porro and the roof are the most used ones. The Galilean one isn’t so much popular because of its lower magnification ability. So, let’s talk about them a little bit. These are the classic types of design that are so common in our day to day life. Yes, those wide hinge ocular types are the ones that we are talking about. They are cheaper than the roof types and can be used for your regular type of watching. If you want to watch birds and objects from a small distance, then this is the type that will meet your expectation. With their cheaper price, they have some drawbacks too. Usually, they are not waterproof. They are best for a simple type of use like admiring things from a comfortable chair and having a good time. Besides, you don’t need to spend much. They have a narrower hinge than the porro types between the oculars. They are more expensive and built for heavy conditions. But, they are waterproof and can sustain the difficult condition of the outdoors. 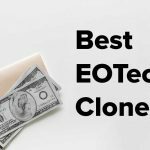 If you are a serious type of user, then these are the ones to go for. Roof types look like a large H letter and their objective lens, prism, and eyepiece are aligned. They offer a powerful magnification system than porro and durability is a big advantage. The downside is they are expensive. So, you need to pick them according to your need. They are the most general and older model types among the three. They have a lower level of magnification between 2x to 3.5x. So, they are not the ideal types for outdoor adventures as you can see. In dental work, they are widely used. The monocular size and weight are also important for backpacking and hiking people. Because the less space it occupies the better for you. 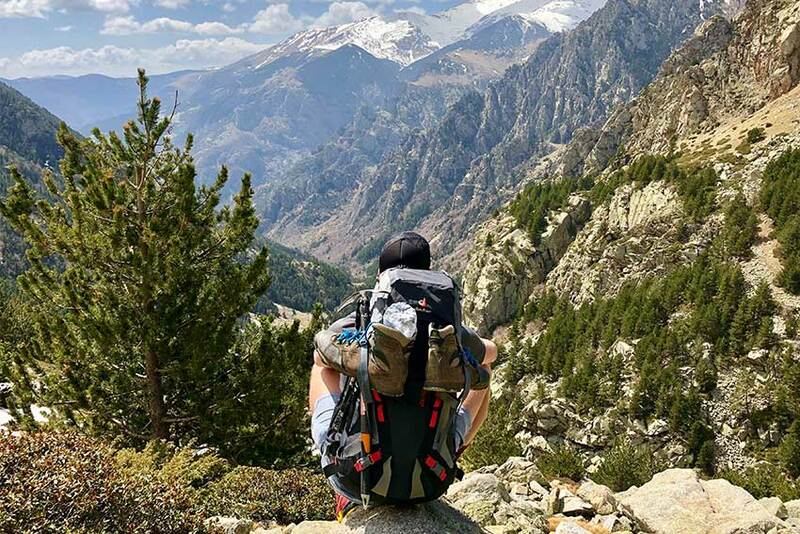 When backpacking, everybody wants to take the minimum amount of gadgets and gears to limit size and weight. So, a monocular should be small and lightweight. That will help you carry it with you. The price of the monocular can vary a lot. The main reasons for that are the quality, brand, specification, materials used and other features. You will get a better quality one if you spend your money wisely. The price may start from $25 and end at around $500! So, knowing the features that you need for your job is highly recommended. Then, you can have a good one at a low price. A pricey product isn’t always the one that you may need. Sometimes, all the fancy features and specifications aren’t that important for your work. Like the EOTech clones that hunting lovers use. Here, we’ve picked the gems from many of them for you that are budget-friendly and top quality at the same time. Shopping online is also a good option to cut the price range to a minimum. Eye relief is the distance of the focal point from the monocular. If that is 15mm, then you need to place your mono 15mm away from your eye. If you are using glasses, then buy a monocular with greater eye relief. That will lessen the hassle for you as your glasses won’t come between the distance and you will be adjusting the distance with ease. A monocular is backpacked for an outdoor environment where it can get contact with water, fog, dust, and shock. So, it needs to be waterproof, fog proof and shockproof. Also, it needs to be compact in armor so that no dust can penetrate. Those are the basic features that you need to consider when buying any monocular. Choose the specifications that you need for your job and pick accordingly. Every outdoor lover wants to enjoy nature as much as possible. Being an outdoor enthusiast, I love it when my gadgets can make my outing perfect and enjoyable too. There are many day time and night time devices, but monocular is such an amazing gadget. Here, we’ve presented you the best monocular for backpacking and hiking that can do justice with you. The elaborate buying guide can help you choose wisely and perfectly. Enjoy your journey!